This was the fourth day that they had woken up at seven in the morning. Considering that these were high school students on summer break, that early morning rising alone was monumental. Even more shocking was the energy that these young people had at this early hour. Thirty-five high school students journeyed to the campus of Marian University in Indianapolis from across the state as well as Ohio and Kentucky. They were the inaugural class of the new, weeklong Missionary Disciples Institute on June 12-17 hosted by the staff of the university. The goal of the camp, which was funded by a grant from the Lilly Endowment, is to equip young people with the theological knowledge and practical skills necessary to become ministers in their own communities. The students quickly absorbed the idea of this “missionary discipleship.” For them, the key was learning how to serve. In a unique move, camp organizers gave the teenagers power to direct their own learning. Each student was asked to choose a breakout group, or “track,” based on the aspect of ministry they wanted to focus on. The first three days of the camp revolved around keynote speeches given by experts and missionaries working in the field. Following the presentations, the students broke into their tracks, which were led by Marian University theology teachers, and dove deeper into the topic through discussion and reflection. On the fourth day, each track group headed out to different sites across Indianapolis and the surrounding area. The goal of this “immersion day” was to put into practice the principles that had been taught all week. “The idea is to really do ministry on the ground today so that they’re formed in an experience that changes them, so when they go back to their parishes they will be ready to do ministry in a new way,” said Matthew Sherman, the Marian University professor in charge of the Diakonia, or service, track. 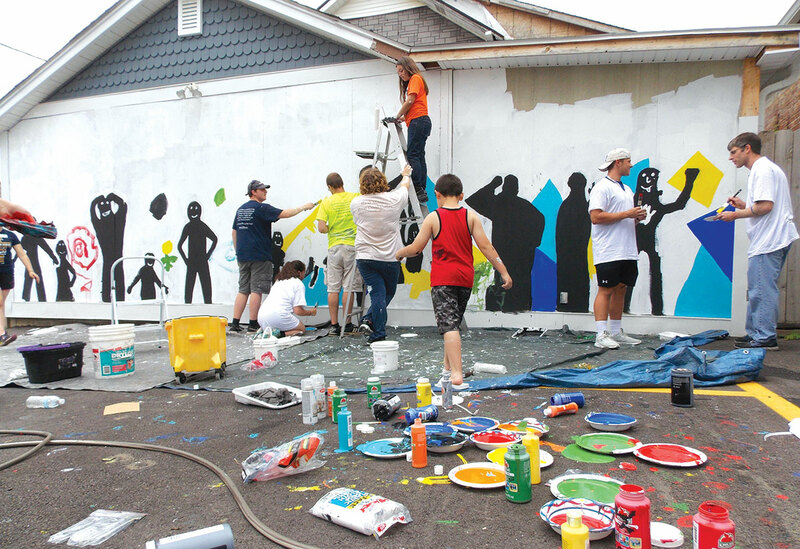 A blank wall of a community center for a low-income neighborhood was the subject of the Diakonia track’s experience. Recruiting local kids to help, the students traced their silhouettes in black paint then brushed vibrant hues in the background for a bright kaleidoscope-like effect. Laughter filled the air as some of the students ended up nearly as colorful as the mural. “I’m serving with a purpose, and I’m serving with joy, and I’m willing to serve,” summarized Patrick Scheidler, a member of St. Bernard Parish in Crawfordsville, Ind., in the Lafayette Diocese. Another group, the Didache, or proclamation track, helped to lead fellow high school students in a theological book discussion at Cardinal Ritter Jr./Sr. High School in Indianapolis. The teens studying preaching on the Kerygma track worked with middle school students at St. Gabriel the Archangel Parish in Indianapolis to find creative ways to express the Gospel. The Leitourgia, or prayer, track headed to Our Lady of Grace Monastery in Beech Grove where the Benedictine sisters taught them about a specific form of prayer and gave them a tour of the monastery. The students learning about community on the Koinonia track visited a community of women who were recovering from addictions, imprisonment, homelessness and other trying circumstances. These students met some of the residents of the Unleavened Bread Café in Indianapolis, a building that functions as a coffee shop, a home for women, and a meeting place for people who want to turn their lives around. Other adults also spoke highly of the high school students as they increasingly embraced the role of missionary discipleship throughout the week. The staff of the Missionary Disciples Institute started the camp because they believed that the teenage years are the perfect time to train young people to be leaders in the community. Many of the students agreed that the camp made them feel more equipped to handle ministry roles within their community. Some departed with concrete plans to put their knowledge into action. Emma Lashley, who is a member of St. Charles Borromeo Parish in Bloomington, said that she wanted to inspire her fellow members of a girls’ youth group. “I want to get more people involved and more people to experience what prayer and the Gospel and service can do,” Emma said. The camp concluded with a “commissioning service” that, mirroring the actions of Christ to the Apostles, sent 35 young people into the world to “make disciples of all nations” (Mt 28:19).